I finally broke down and bought the Ridgid R4512. This has me thinking about shop layout. I currently have a 4×8 assembly table with dog holes and a bottom shelf for storage of nuts, bolts, screws, etc. It is only 32” tall, however, compared to the 37” height of the table saw, and raising it would be a bit of a challenge but not impossible. It’s on a pipe base, so to raise it I’d likely go with some kind of Paulk/torsion box solution. The picture attaches shows the current orientation of things, description below. west wall has a 28”x96” bench built in against the wall that is also my miter saw support, and the wall the beginnings of a tool wall with plywood attached to the wall. The NW corner of the shop is lumber storage with “sticks” on the wall and “sheets” in the cart. Next to that, going east, is a bench with a small drill press and band saw on it. The NE corner is shop storage and a water heater, and the east wall is all house storage. There are two 10’x10’ roll-up doors on the south side, and a man door in the SW corner. Next to the man door is the rolling tool chest and next to that is the compressor. What I’d like to do is to keep the assembly table as a separate entity to the outfeed so that I’m not obstructing outfeed with assembly. Given the size of the space I would think I easily have the room. The second photo attached shows my first thought regarding a new layout to include the new table saw. The dashed lines in both images reflect 9’ from the wall so that I can line up the blade edge with room to cut 8’ material without moving the saw. Since I found no question, I assume you are inviting some feedback and opinions concerning your shop layout thoughts. By the way congratulations on the new table saw! My preference would to leave the table saw in its current orientation (first sketch) but with an added layout table (which I assume will do double duty as an outfeed table). If the layout table is not yet built, designing the height to include some locking casters would make moving the layout table much easier should it every have to be moved. My preference is based on maximizing the length of lumber that can be ripped. In the current orientation, you are only limited in the length that can be ripped by the distance from the table saw blade and the nearest infeed-side obstruction. The assembly table could be positioned on the outfeed side of the saw and to the east of the saw. If it is located a little more than 4’ south of the outfeed side of the table saw blade, a full sheet of plywood could be ripped or crosscut. But the immovable assembly table could limit the space for the other uses you mention on your workshop page. Making the assembly table mobile could allow it to be moved out of the way when the need arises. Assuming it would be difficult to directly mount casters to the pipe legs of the assembly table, perhaps a frame from 1X material could be made on which the assembly table would set. Some shallow counter-bore holes in the frame could lock the pipe legs in place. A set of 3” heavy duty locking casters could then be mounted to the frame. Peachtree Woodworking supply offers swivel locking 3” casters rated at 300 pounds (I assume each). The 1X (¾” thick) frame plus the overall 3” caster height of 4-3/16” would raise the assembly table to 36-15/16”. As an aside, it appears that the drill press obstructs the outfeed side of the band saw and thus limits the size of material that be cut. At the same time the band saw limits the size of material that can be drilled. If these indeed are problems, placing each machine on its own mobile base would allow either machine to be pulled out free of obstructions. Always a tough question to answer. We all work differently, and mostly alone. As your shop evolves, as in new equipment, tools, and benches, at some point work flow has to give way to space available. Best advice I can give is to create a plan, write it down and use it for a bit. Find out what does work, and what does not and make adjustments. Bottom line, expect to move stuff and it is heavy so wheels are your friend. In all of my shops I have put the TS directly in the middle of the space, orienting the direction of material feed along the longer dimension of the room. So, if this were my shop, I’d move the TS to the middle of one of the garage bays, or even move it a bit closer to the overhead door since you can always open the door to rip a particularly long board. Like Jbrow, I’d stick with something close to your first layout. Thanks guys. I guess I got in a hurry posting and didn’t get in all the details or ask a question. I’m trying to decide if I want to build the outfeed table or raise the assembly table and use it for outfeed in the short term. raising the assembly table is something I want to do anyway, but it’s also a bit more complicated than I’d like, for a variety of reasons (mostly of my own choosing and due to my perfectionist nature). The current assembly table is on a pipe base with locking casters, so it’s constantly being moved around. I’m planning on putting the outfeed table, if I build one, on casters as well. One of the reasons I keep trying to keep the assembly table closer to the west is that’s where all the tools are and I’d prefer to limit the back and forth. Although one of the shop projects I’m planning is a rolling tool cart (If I don’t get impatient and buy one first) so maybe it’s not that big of a deal to have the assembly table further away. All of my clamps are currently on a wall rack under the lumber storage, but they could get moved. Possibly even attached somehow to the assembly table for storage. The drill press and band saw do obstruct one another on larger material, but they are both pretty cheapo and rarely get used on anything big anyway. Long term plans definitely include getting either floor standing versions with rolling bases or at least better quality benchtop versions and building rolling stands for them. after reading the above, I think what I’m leaning towards is something like this. Only real issue is that currently the tool-wall is where the green box is shown, so I’d need to re-loacte those tools to where the blue box is shown. Right now it has the clamps and things like squares, etc. so that’s all the kind of stuff I’d want on the assembly table. The revised layout looks workable and should limit the times when the assembly table needs to be moved around. It is not clear to me the extent to which you woodwork. Your last post suggests that you have some plans to further upgrade shop tools and presumably to take on some more involved projects. You mentioned that at some point you may upgrade the band saw and/or drill press. If you plan to add new tools to the workshop and spend more time woodworking, taking a fresh look at the overall shop may be helpful. A comprehensive shop plan that considers the projects you will build, the placement of existing and future tools, and workflow now could offer immediate benefits and make those down-the-road upgrades easier. If you are so inclined, it could start by considering whether moving the entire shop to the east garage bay might work better. My reasons are that the north and west wall windows are obstructions limiting where tools and shop storage can be located. I suspect the west window is interfering with planning the relocation of the clamps closer to the assembly table. The other reason is that, as now figured, lumber and sheet goods must be carried to the back of the garage. I would personally prefer to have lumber storage closer to the garage doors. 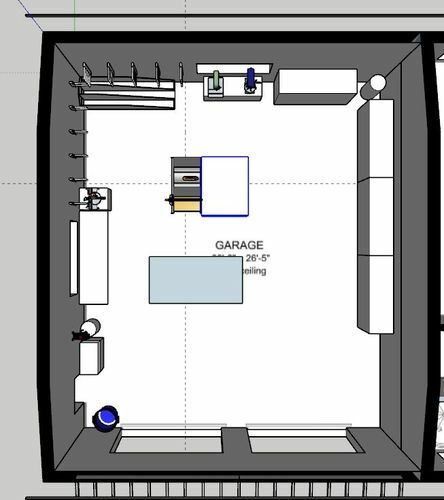 Although less than a perfect solution, an existing east wall storage cabinet could be set in front of a window if the shop is moved to the east bay. Since this exercise initially involves some relatively easy doodling in Sketchup, moving things around in cyberspace would reveal whether flipping the shop might work better or that it is not worth the effort. Your table saw setup is all wrong. Put your table saw where your sheet goods come in. If you need more than 9’ you can always open the door.. Your table saw setup is all wrong. Put your table saw where your sheet goods come in. If you need more than 9 you can always open the door.. In my shop I don’t work off of goods coming in. The lumber is all pre-purchased and stocked in the back corner. So the two saws are placed near where the lumber is stored. I’ve considered this several times. There are a few issues which keep me from doing it. One is that there are two circuits, with a total of four outlets around the north and west walls (two each) while there is only a single outlet on the east wall. Additionally, the east wall is framed/drywall vs block for the other two, and the other side of the wall is a guest house. This means the framed wall will be harder to attach various things to, and any noise on the east side is heard through the wall moreso than noise on the west. Finally, there is a water heater in the NE corner that serves the guest house, and I’d like to stay clear of it. I’d love to have the lumber storage in the SE corner though, along with the cutting tools, so that I could offload and process the lumber more easily when it comes in to the shop. I did, however, design the plywood storage cart so that it’s on wheels so I can bring the cart to the truck, and I offload stick lumber by moving the assembly table out of the way and backing the truck in. I won’t probably be moving around the table and saw, but even if I just back the truck in to the east bay it’s still a pretty short run to get the wood to the storage and processing area in the corner. Congrats on the saw and excellent work space. 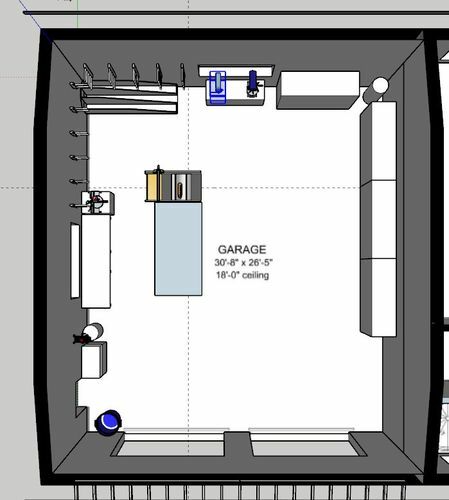 When I laid out my shop that is a similar size, I carefully considered how I planned to use the space. As the shop was a new build I did have some flexibility. I have a single 10’ garage door near one corner on the long side of the shop. From there, the work flow drove the layout. 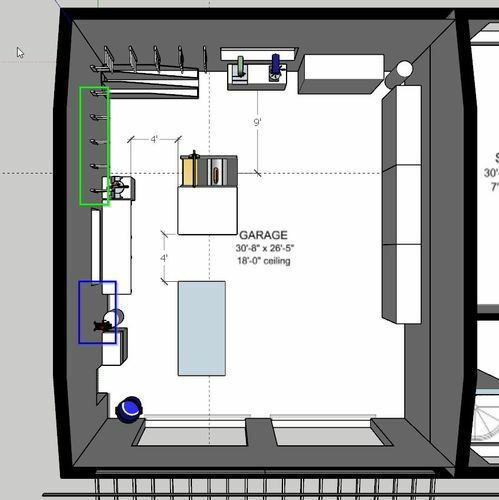 With sheet goods stored along the wall immediate adjacent to the garage door and the table saw closer to the garage door oriented with the long axis of the shop near the center. My outfeed table is 8’x8’ and serves as outfeed for the table saw, assembly, table, and provides long storage for board stock in the under side center of the table. The out side of the center table houses my various tool carts that act as drawers on wheels. Essentially the work flows from full sheet or rough stock around the shop to the finish area on the wall adjacent to the garage door. The tools are all on mobile bases to allow use and storage when unused. I still have several areas to tweek (after producing some results for SWMBO), but the space is coming along nicely. Bottom line, think about how you will use the space for each stage of the projects you plan to make. Keep the areas flexible to allow for changes or new tools and have fun. No matter how well you plan, the shop will change. Put everything on wheels and move things as needed. I do not break down sheet goods in my shop but use a track saw in another area or outside. I configure my shop to meet the project I am working on. If I am planning long boards, I pull the planer out from the wall, move the cabinet saw, and open a door. First, I would reverse the direction of the TS so material comes in thru the door. Second, I would consider putting the right side of the TS against the wall and assembly bench in the center. Material doesn’t come in through the door for me because it all gets pre-purchased and stocked in the back-left corner. I can’t really come up with an alternate location for the material storage that (a) gets the TS to a point where the infeed is coming from outside and (b) keeps the materials as close to the infeed as possible. As mentioned above, ideally I’d have the material storage all along the bottom-right corner and the TS just to the left/west of that, but I can’t really use that wall or that side of the space for woodworking due to the reasons outlined. I’m in favor of dedicated outfeed support and separate assembly table. I like an assembly / power tool surface to be about 38-39” high. I think a 48×56” size works pretty well. The outfeed support can be even smaller, and still catch full sheets of plywood safely. Some of it depends on the size of your saw of course. Or you could make the outfeed table pretty compact, which would work for boards up to 6’ long, and add an outfeed roller for full sheets of ply. I just know a 4×8 table would not work in my shop. If I needed that much work surface, I would rather have two rolling carts than one big one. Good luck on the new layout. Go with mobile bases and double-lock casters on everything, that way if you change your mind, it’s easy to fix. The 4×8 has been an issue on some rare occasions just in terms of having to walk around it but otherwise I have more than enough room for the mass of the table and the larger size has come in handy several times. it was a product of already having the rolling pipe base and the ease of simply slapping down two 3/4’ plywood sheets and some hardboard on top to get an instant table. If I was starting from scratch though I might do two tables I could clamp together, but then the merged tables wouldn’t be as easy to roll around. I was toying with splitting the outfeed table into two pieces.